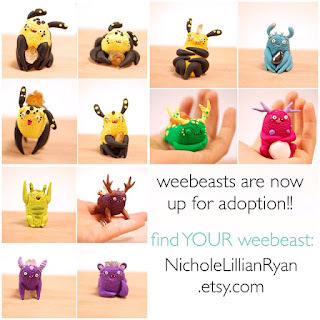 Nichole Lillian Ryan - Weebeasts & pals: Who will get the golden egg?! Who will get the golden egg?! Who will get the golden egg (and $20 store off coupon code)? One of the first 12 weebeasts will come with a special GOLDEN clay egg- (it will be randomly selected out of the box of eggs I have set aside for all of the weebeasts) If you happen to get the golden egg it will come with a special $20.00 coupon just for you! Good luck and remember it's only the first 12 weebeasts of the numbered series that is a part of this contest, so hey you have a 1 in 12 chance of winning, yay! Thanks for all of the support- glad you guys are liking these weebeasts so much!